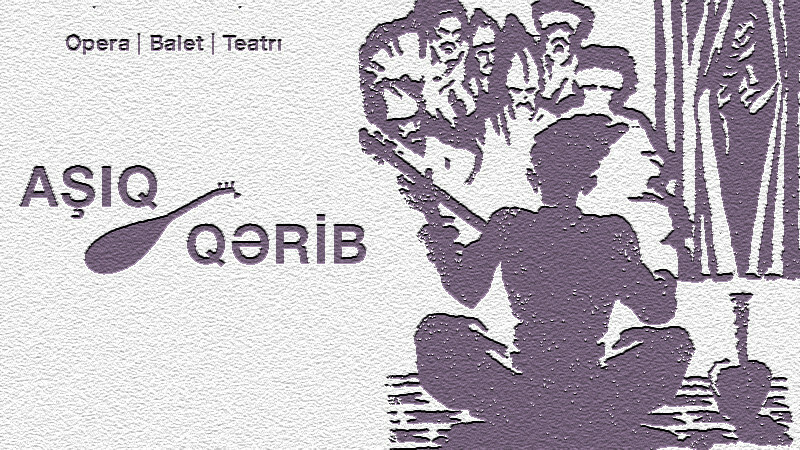 Ashuq Qarib in Azerbaijan State Academic Opera and Ballet Theatre buy tickets online. Delivery of tickets for the event Ashuq Qarib. Resident of Tabriz Rasul dreams about daughter of Tbilisi’s khodja Sanan Shahsanam. He starts to sing as soon as he wakes up. Surprised mother, sister and neighbors ask the reason of singing. They find out that Rasul will travel to Tbilisi after his beauty. They try to talk him back. But Rasul is firm on his decision. Big feast organized with respectful Mahmud. Ashig Vali and dark skinned girl are singing and dancing, guests are having tea and enjoying themselves. Rasul appears. He’s asked to praise Tabriz. Rasul sings ode for Tabriz. Everyone excited except for Ashig Vali. Mahmud asks Rasul why he left his homeland. Rasul tells everything. He’s advised to walk neighbourhood to find Shakhsanam. Shakhsanam is enjoying herself with her girlfriends in the beautiful garden. In love with her Shakhvalal and his friends enters the garden. Shakhsanam doesn’t accept his offer. She’s always thinking about someone she dreamed about. Her girlfriends leave and she hears singing. Rasul is singing that named himself Ashig Garib. They meet and recognize each other. Shakhsanam’s father agrees to marriage between Shakhsanam and Shakhvalal. Garib’s mother also asks Shakhsanam to marry her son. Khoja Sanan asks for 40 sacks of gold in return. Garib is forced to leave for another country in order to earn that amount. He asks Shakhsanam to wait for him for 7 years. Years pass. There’s no news from Ashig. Shahvalal orders Guloghlan to find and kill Garib. Guloghlan deceives Shakhvalal by showing his own shirt covered in blood. They show shirt to Shakhsanam too. Garib courtier ashig of pasha of Arzurum. He’s very famous. Mahmud is looking for Garib by Shakhsanam’s request. They meet in the yard. Pasha of Arzurum finds out about everything. He gifts Garib with 40 sacks of gold and lets him go. Seven years later. Sister and mother wait for Garib. Their meeting is very warm and heartfelt. Garib rushes to Shakhsanam as he finds out about her wedding. Shakhvalal’s wedding. His friends and Guloghlan are at the feast. Suddenly Garib and Mahmud appear. Shakhvalal kills Guloghlan and attacks Garib. But Mahmud stops him. As a result Garib and Shakhsanam’s pure love triupmhs.